Click here for the First Crack Video! 7 protesters managed to get into the construction site of the dam despite the fact the authorities had 22 police in 9 cars monitoring the area plus all the security personnel of Impregilo and Landsvirkjun. 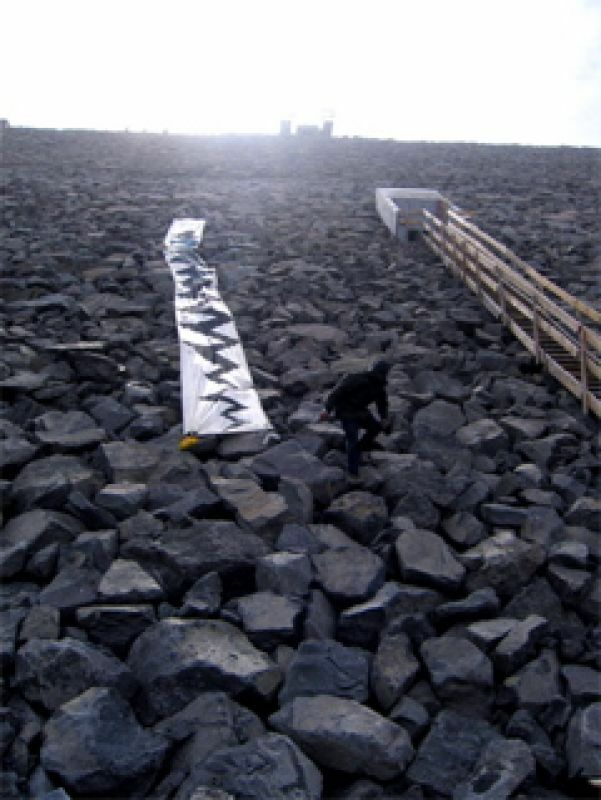 The protesters put up a banner on the dam wall displaying a massive crack. The first crack of many to come. The Kárahnjúkar dams are being built right on top of a cluster of active geological fissures. Of course the police got very upset about this and arrested people from the protest camp and kept them at the police station for 12 hours. Yet they didn’t manage to catch anyone during the action, so they couldn’t charge them for anything. we are writing up a “wolf” a positive congradulations, for the banner/crack on the dam- But What date is it.!!! Please let us know as soon as you can. The First Crack in the Kárahnjúkar dam appeared 1 August 2005. There will be many more!